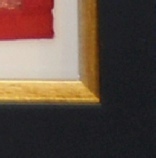 The premier picture framers for south London, Bromley and north Kent. We were presented with a real challenge with these Indian quilts which our customer wanted to present as framed hangings. They were beautifully colourful but needed to be framed in a way that presented them stylishly, but without having the framing dominate the quilts. The customer chose a contemporary square black frame which was deep enough for us to recess the quilts away from the glass with a spacer, and have room for a gold slip inside the frame. 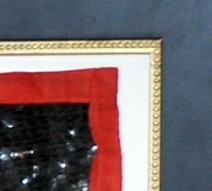 There were 2 sizes of frame chosen and 2 different slips. Our customer wanted to use conservation quality glass in order to protect them from fading and reduce the amount of reflection. This helped in that we needed to use a heavier gauge glass than the standard 2ml due to their size and Tru Vue Conservation Clear glass was perfect as it is 2.5ml thick as well as offering the required standards within budget. We were fortunate that the required length for the hangings was within a few millimetres of the maximum available length. 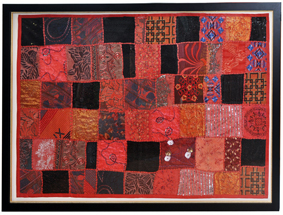 Because these quilts were hand made from different textile samples, they were not, by any means square. This gave us problems with framing them, but the outcome, with the irregular shape/edges actually added a lot of charm to these pieces, which when completed are absolutely magnificent. Please have a look at the larger images. Unfortunately, due to their size, they were difficult to photograph and there are some reflections which detract from the image.